My Ly in Wall Heath, near Kingswinford sleeps 5 people. 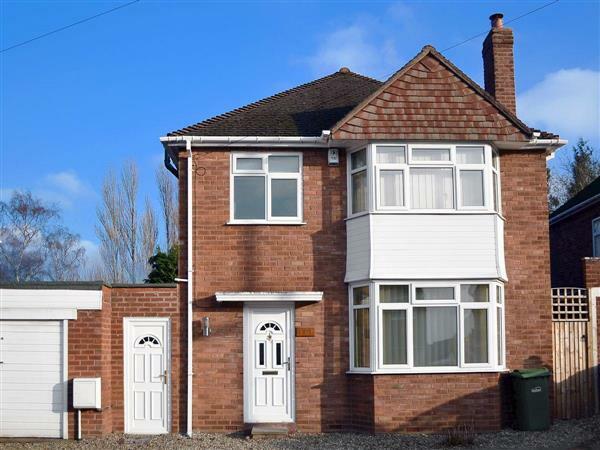 My Ly near Kingswinford is a detached house which is located on a quiet estate in the village of Wall Heath, near Kingswinford and has been thoughtfully designed especially for holiday makers who wish to explore the area. The holiday property has a lovely, private, enclosed garden which is not overlooked, and there is a private hot tub, sitting out area and barbecue, ideal for gathering the family to enjoy an al fresco supper as the sun sets. Wall Heath is a small country village with 3 pubs, restaurants, convenience stores, butchers and bakers, and is within walking distance of the property. Holbeache House, famous for the capture of the Guy Fawkes conspirators, is just down the road. The village of Kingswinford, 2 miles, is featured in the Domesday Book and has all local amenities and a market every Friday and Saturday. For dining out, there is the Hickory Smoke House and Grade II listed Himley House Hotel, set in a landscape sculptured by Capability Brown, both within a mile of the property. Himley Park is just down the road with its beautiful walks and golf club. Walk along the path on the disused railway line, half a mile away, which gives access to miles of countryside and leads to Tettenhall village in Wolverhampton, or Dudley Town. It is in a convenient location on the edge of the West Midlands and the nearby neighbouring counties of Worcestershire and Shropshire. Tourist attractions within easy driving distance are the Broadfield House Glass Museum, the Black Country Living Museum, West Midlands Safari Park, Dudley Zoo, Birmingham city centre attractions , Merry Hill Shopping complex, the Severn Valley Railway running from Bridgnorth to Kidderminister, Malvern Hills, Alton Towers, Trentham Gardens, Worcester and Lichfield cathedral cities, the National Memorial Arboretum, local theatres including the Birmingham Symphony Hall and of course the famous Christmas market in December. The shop, pub and restaurant are ½ mile from My Ly near Kingswinford. Dining room: With French doors leading to the garden. Kitchen: With gas oven, gas hob, microwave, fridge/freezer, dishwasher and washing machine. Gas central heating, electricity, bed linen, towels and Wi-Fi included. Initial logs for wood burner included. Welcome pack. Enclosed lawned garden with garden games, patio, garden furniture and barbecue. Hot tub for 6. Garage/equipment store. Private parking for 3 cars. No smoking. Holidays at My Ly run from Friday to Friday. Pets allowed at My Ly . For a better idea of where My Ly is, you can see My Ly on the map below. My Ly is in West Midlands; should you be on the lookout for a special offer, you can find all the special offers in West Midlands. It's always worth checking to see what is on offer at the moment. Do you want to holiday near My Ly (UKC541), you can see other cottages within 25 miles of My Ly; have a look to find your perfect holiday location.